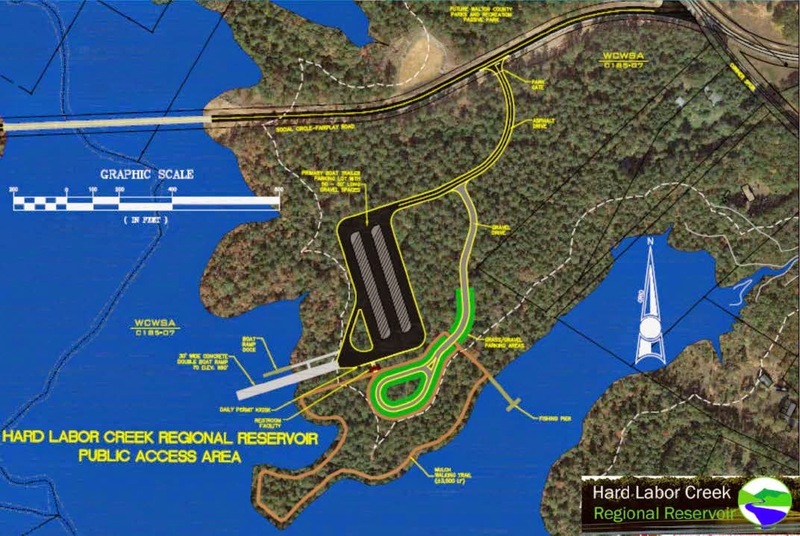 The Hard Labor Creek Regional Reservoir Management Board deliberated nearly 30 minutes at its regular meeting on Tuesday before deciding it had no alternative but to pay an additional $410,000 for professional services for the ongoing construction of the dam. Schnabel Engineering, with offices in Alpharetta, requested the additional payment on top of the $923,000 originally agreed upon, or a 44.4 percent increase, to continue construction testing and engineering services for the dam through April 1 of 2015. Before voting to agree to the payment to Schnabel, the Management Board asked Project Manager Jimmy Parker of Precision Planning Inc. to get detailed figures on the costs with the goal of transferring some of the costs to Layne Heavy Civil Inc.
Layne, a global construction company with offices in Fairburn in Fulton County, has the $17.8 million contract for construction of the dam and reservoir. In other action on Tuesday, the Management Board decided to spend $800,000 for construction of recreational facilities at the reservoir. Walton County will be responsible for $569,600 of that cost, with Oconee County responsible $230,400. The Management Board accepted a timetable running through 2018 for the recreational facility, to be constructed south of the rebuilt Social Circle-Fairplay Road and east of the main body of the future reservoir. Design and permitting, to be handled by PPI, which has offices in Monroe, will run from January of 2015 through March. Bids will be let in April and May of next year. Construction will continue through 2018, as the reservoir fills. The project includes a boat ramp with accompanying dock, a fishing pier, restroom facilities with a well and septic system, and parking. Money for the recreational facility will come from reallocation of funds in the $5.8 million General Contingency Fund for the project. Not included in the timetable or funding is a future passive park, to be financed by Walton County alone. 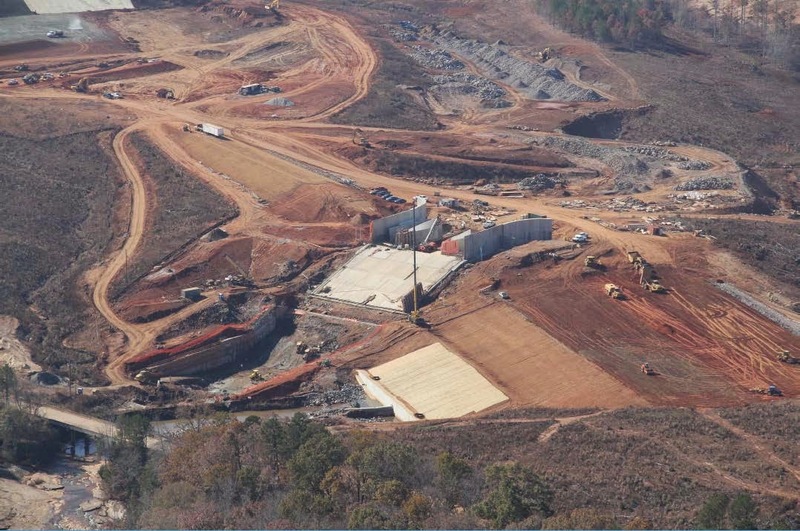 The reservoir, in southeastern Walton County, is a joint project of Walton and Oconee counties. Parker gave the Management Board an overview of the dam and reservoir construction, indicating that 75 percent of the land for the reservoir has been cleared, that 85 percent of the concrete riser for the intake structure is finished, and that 70 percent of the earthen dam has been built. As is usual, he provided a series of photographs documenting the work on the project, and the picture above of the dam is from Parker’s presentation. Parker told the group that the most important thing he had to discuss regarding the construction was the addendum to Schnabel’s agreement for professionals services for the dam construction. Parker reminded the group that the services of Schnabel were required to meet the requirements of the state Safe Dams Act. Schnabel inspects the work of the contractor and has several people on the site doing that work, he said. Some of the extra work that Schnabel has done was the consequence of washout at the dam site during flooding in December of 2013, Parker said, but that was not the only cause. Some concrete had to be removed after it had been poured and had to be replaced. Board members questioned the best strategy to follow in seeking to get Layne Heavy Civil to pay some of the $410,000. Board Chairman Kevin Little suggested the request by Schnabel be tabled until the Board’s next meeting in February, when Parker and Bill Crowder, also with PPI, could report back on the details of the extra expenses. Crowder and Parker said that Schnabel needed to be paid before that time to keep the dam construction on schedule. Parker told the Management Board that the budget contains a $1.1 million contingency funds for the dam construction, and the $410,000 could be taken from that amount. The motion to pay Schnabel immediately passed the Board unanimously. The Management Board met for about 70 minutes in the historic Walton County courthouse in the center of Monroe. The room does not have a sound amplification system, and it is difficult for people not sitting at the table to hearing what is said. No media representatives were present, and I was the only audience member not associated with the Board. My video recording of the discussion of the Schnabel agreement is below. I have increased the volume of the sound to make it possible to understand most of what was said. Parker is at the head of the table to the left and is speaking as the video begins. Little is at the head of the table at the right. Oconee County is represented on the Board by Commissioner Mark Saxon, County Administrative Officer Jeff Benko, and Commissioner Jim Luke. Saxon is the second person on the right-hand side of the table as shown in the recording, followed by Benko and Luke. Former Commissioner Chuck Horton, now an alternate on the Board, was seated away from the table at the left of the camera and spoke as the discussion progressed. OCO: Discussion of Schnabel Request from Lee Becker on Vimeo. Half a million down the drain just like that...with no one from Oconee County asking why and demanding answers??!! Jimmy Parker was afraid to table the request because someone might actually dig into the request and get answers. Everything that has to be hurried up shows a real problem, no transparency, and the question as to who is really getting paid and how much. Have to wonder how that $410,000 is going to be divided up --what is Jimmy Parker's share?